This stunning poster protests the War in Vietnam and urges a National Student Strike on May 6, 1970. 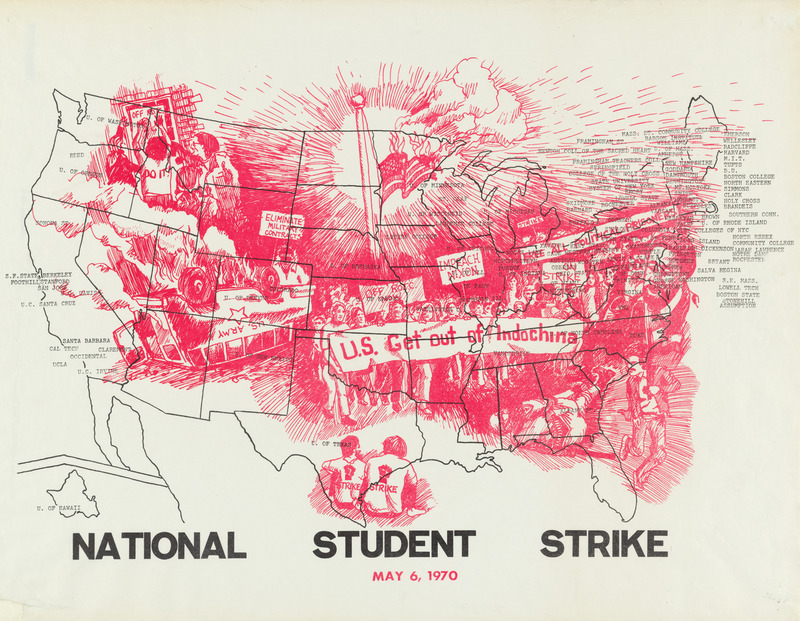 It's dominated by bold images in red, overprinted on an outline map of the U.S.: a burning flag at half mast; a U.S. Army bus, overturned and on fire; and everywhere students on strike. The student banners say "U.S. Get out of Indochina;" "Eliminate Military Contracts;" "Impeach Nixon;" "Off ROTC;" and "Free All Political Prisoners." Across the country the names of more than 100 colleges - presumably those already committed to the strike - are set in type. The President's speech set off a firestorm on campuses. Student protest demonstrations began immediately at Princeton and Oberlin, and "within a few days, strikes and other protests had taken place at scores of colleges and universities throughout the country." Scranton 1970, 18. On Monday, May 4, the editors of the student newspapers at 11 Eastern colleges published a joint editorial calling for "the entire academic community of this country to engage in a nation wide university strike." New York Times, May 4, 1970, p. 1. Later on that day, four students at Kent State University were shot to death by members of the Ohio National Guard while engaging in a campus protest. "During the six days after the President's announcement of the Cambodian incursion, but prior to the deaths at Kent State, some twenty new student strikes had begun each day." Scranton 18. The student protests movement proved widespread, deep and persistent. "During the four days that followed the Kent State killings, there were a hundred or more strikes each day. A student strike center located at Brandeis University reported that, by the 10th of May, 448 campuses were either still affected by some sort of strike or completely closed down." Scranton 18-19. Some 158 institutions were reported to be on strike "indefinitely." New York Times, May 12, 1970, p. 19. "An estimated 4.35 million students at 1,300 universities and colleges, or 44 percent of the nation's total, protested the war in Southeast Asia and the murder of their fellow students, closing many universities in the process." Ness 2015, 4:1191. This poster is not listed in OCLC, and it's not known where or by whom it was made. The only other copy I've been able to find is in the archive of the "April Third Movement," http://www.a3mreunion.org/archive/posters/posters_1970_nss.html, accessed September 16, 2016, which suggests that it was produced in the Stanford area. It was probably published just before or on May 4, because it lists the names of more than 100 (presumably striking) schools, but not after May 4, because it seems likely the artist would have included a reference to the Kent State shootings had he or she known of them.